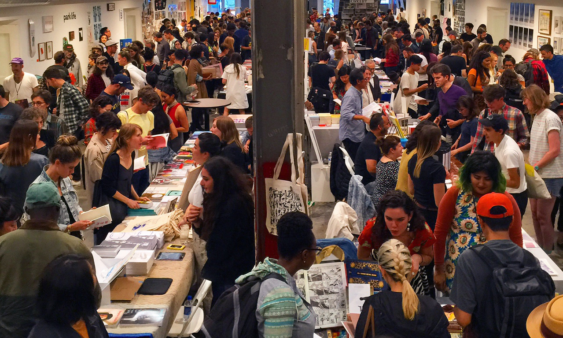 The 2018 SF Art Book Fair is an annual multi-day festival of artists’ publications. This multi-day event is free and open to the public and will feature artists’ books, art catalogs, monographs, periodicals, zines, printed ephemera and artists’ multiples. These works will be presented by over 100 independent publishers, antiquarian dealers, artists, collectors, and enthusiasts. A preview will be held on the evening of Friday, July 20, 2018 from 6 to 10 pm, featuring live music and refreshments. The fair is organized by Colpa Press, Minnesota Street Project and Park Life with the mission to further cultivate the unique art publishing community within the Bay Area and beyond. The SFABF will feature a diverse range of talks, discussions, book launches, on and off-site special projects, exhibitions and book signings.